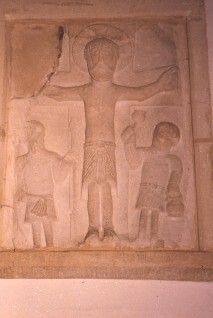 Wall panel showing Crucifixion scene, dated to the early eleventh century. The cross in this scene has arms that widen towards the ends. Christ is bearded and with a moustache, and he is wearing a long tunic. His feet are not crossed. His halo has a cross in it, and the arms of this also widen towards the ends. On the left side (Christ's right) there is a soldier holding a spear in his left hand. On the right there is another soldier who is holding a cup in his right hand and a bag in his left. These figures are drawn on a smaller scale to Christ.